Annique, my wild and beautiful Prescott College roommate and Thomas her friendly, intense and loving husband whom she also met at college settled down in the little town of Putney, VT. We couldn’t leave New England without a brief visit. 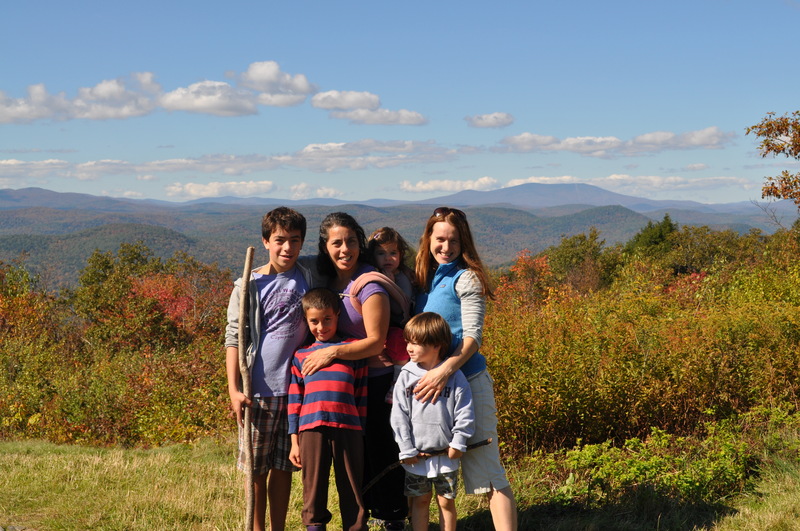 Over a decade ago we visited them in their cute rustic house on Putney Mountain with a 2 year old Jacob. Thomas shared tales of tracking animals in the VT winters – hare, deer, weasel following their prints in the snow, as Annique cultivated her hearty garden and found her own roots in the rugged and beautiful North Country. It’s funny how the little things that seem inconsequential in our life can make subtle and lasting ripples. Way back in 2002 Annique taught us the art of singing to their chickens when we gathered the eggs to thank them (and to calm the rooster so he didn’t peck at us)! That little chant has become part of our family thankful repertoire all of these years since and is such a sweet way that Annique and Thomas are woven into our everyday life. Over the last few years they designed and built a beautiful home tearing down the old house and keeping and developing the gardens. Annique, a well respected Midwife and Thomas an accomplished Acupuncturist and Chinese Doctor, share an office/practice in Putney called Medicine for the People and seem to be living a very busy and meaningful life as integral resources in their community. Pretty quickly our families connected in a warm and deep way. This visit we met Samuel their very sweet 4 year old son. Elias quickly and quietly got to work on Samuel’s train set and Ila at dismantleling Elias’ work! As they have been lacking in traditional toys they were quite pleased to play and play and play and Samuel was a generous playmate. Jacob was under Thomas’s spell after quickly realizing that they share common interests…Thomas has a vintage collection of comic books…! This coupled with his mastery in the art of bow making, tracking and animal awareness kept Jacob teetering between nonstop questions and nonstop reading. He had his first introduction to characters like “the Punisher” and was later given a three volume set of books on how to make bows and arrows, the Bow Makers Tome. Jacob was SOLD! Although our visit was short we found time to hike through the beautiful VT autumn with Annique and Samuel, walking a few miles up the road from their house towards the top of Putney Mountain watching raptors soaring on the drafts above. The kids played on a magnificent old and huge tree, hiking home barefoot and free. The day before we arrived, Annique, Thomas and their friends killed and prepared chickens for the winter – 100 of them. Although in my vegan years this would have been quite difficult for me to bear, in my recent incarnation as an omnivore I was intrigued by the process. Our drive across the country has allowed for a few good conversations on food, food choices, raising animals and farming. Very recently Jacob and I discussed different slaughtering techniques and theories comparing factory farmed animals and humanely raised animals. I understand, based on my reading and my brief time working on a ranch in Colorado, if killed humanly the animal does not experience fear or as much anticipation and terror in the end. This is so much kinder to the animal and healthier for the person eating the meat. Unsurprisingly, this was Jacob’s first question to Thomas after finding out about the chickens. Thomas described how he held each chicken closely and compassionately in his arms until he felt them stop “buzzing like a refrigerator” and felt more calm. A wide eyed Jacob (and Michelle) were captured by this story. Evening was spent with the boys helping Thomas stack a truck full of wood near the back door of the house in preparation for a long VT winter as Annique and I prepared incredible chicken enchiladas and fresh salad from the garden. Around the fire Thomas brought out arrow making materials and the boys learned the art of crafting their own arrows by gluing on the feathers and the tips with the proper tools. They made a list of all of the things that Jacob needed to craft his own bow over the next few months which fit in perfectly with his 6th grade Waldorf curriculum and made missing school a tiny bit easier to bear. Stocked with delicious syrup and VT hard apple cider, we packed the minivan and shared hugs trying to convince our friends why reuniting in Arizona this winter is an excellent idea (hint hint if you are reading this Annique and Thomas).